Jean Royle was born near Sheffield, England in 1915. She was the daughter of the landscape painter Stanley Royle RCA, RBA, ARWA, who was cousin to the artist Herbert Royle. Jean studied painting and general art and design for two years at Sheffield College of Art and for a further two years at the Nova Scotia College of Art in Halifax, Canada. She returned to Britain in 1934, and after a years’ sojurn in London studying painting independantly she returned to Sheffield where she met her future husband Stanley Copleston, a committed pacifist. He introduced her to The Sheffield Settlement which was then under the direction of its charismatic founder and fellow pacifist Arnold Freeman. He gave Jean responsibility for the scenery design of The Little Theatre. She was always a great walker and the Settlement Rambling Club afforded the opportunity of walks in the Peak District with other like minded people. Two canvasses from this early period represent her affinity with the landscape of the Derbyshire moors. It was on one such walk that she and her fellow ramblers first heard that war had been declared between Britain and Germany on September 1st 1939. Peggy Freeman, the daughter-in-law of Arnold Freeman, recounts the experience in her letter. The war years caused much displacement. Concientious Objectors in the 1939 – 45 war had to go before a tribunal and were offered two options: a period of penal servitude or taking a menial post as a labourer. Stanley Copleston, an educated and intellectual man, opted for the latter and thus became a farm labourer. He and Jean married in 1940 and moved to Kent in 1942 where, the following year she became the mother of twins. Her third child was born three years later by which time the family had moved to Suffolk. Her early married life was spent surviving an itinerant lifestyle in south east England and East Anglia in small ‘tied’ cottages – hence no security – on little finace and with no electricity or ‘mod cons’. 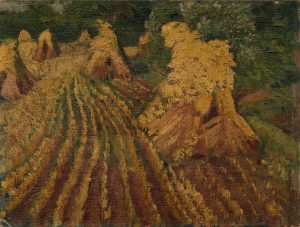 It was a harsh, nomadic life and opportunities to paint were scarce but despite these obstacles Jean produced a series of paintings whilst living in Suffolk. 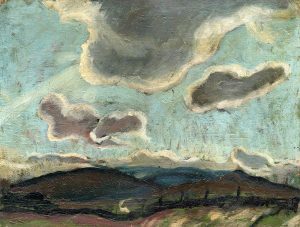 In these early canvasses she captures the essence of the English landscape in the high rolling clouds and twilit harvest fields. It is always the un-peopled countryside that interests her. In 1960 the family moved to Nottinghamshire which at that time was an area actively involved in coal mining. The change of scene from unspoilt rural tranquility to vibrant industry was dramatic. Jean was fascinated by the looming presence of the colliery pithead and its dark slag heaps semi-silhouetted against the sky. 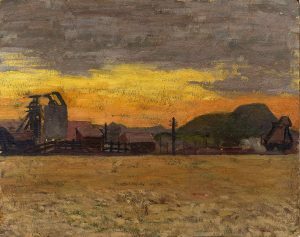 She began a series of paintings which again captured the atmospheric quality of an evening landscape, though this time with the ominous ‘eyes’ of the pit head lights, or lit by a burning sunset. These ‘pit’ paintings were followed by a series of five studies of the view through a window of her home at North Lodge on the edge of Newstead Abbey Park. By the middle of that decade, her children having grown up and left home, Jean was afforded more opportunity to pursue her art. She began to make drawings of trees, a subject for which she had great affection, and throughout the rest of her life she continued to develop these structural and analytical studies. In 1971, when her husband retired, she moved to live in the more suburban outskirts of Nottingham. This was not an environment that she felt at one with but even here she found unexpectedly intriguing subjects by way of the River Leen at Bulwell with its industrial background and the curious half built houses on a developing housing estate. See Jean Royle’s sketchbook to view these images. In 1976 Jean was widowed. Determined to remain independent and not to become isolated she joined local art and craft classes and returned to a medium that for her had been long unused – the lino print. Over the next decade she produced a series of cleverly designed original cards, some specifically for Christmas. Much preliminary work was required to construct these designs and her sketch books of this period are full of the preliminary sketches. 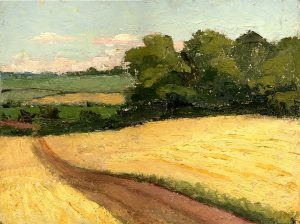 At the same time Jean was developing her undying interest in landscapes, experimenting with different media and inevitably drawn to subjects in which perspective leads the eye out and beyond to the furthest horizon by way of a winding cart track, a pathway through snowy woods, the furrows of a ploughed field, electricity poles and wires looping across the countryside, hedges stretching off into infinity or the curving lines of cornfield stubble. Cornfields and harvest fields have a particular significance for her. In the early 1990’s a perceptible change came into Jean’s personality and in 1994 she was diagnosed as suffering from Alzheimer’s Disease. No more creative output took place. Jean Royle died on October 23rd 2002. As an artist she lived always in the shadow of her father’s acheivement and it was inevitable that her own style should be influenced by his, since she was his pupil from a very early age. Whilst she admired his work she strove to develop her own style. 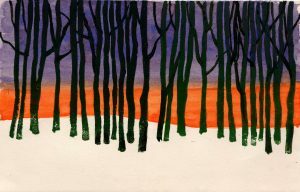 Not seeking to challenge or rebel against established values in art, she chose to use a traditional format to express her love – one might almost say her idolatry – of landscape.